Ambient lamp project with more features and more colours! I announced my ambition to build my very own wake-up lamp à la Philips back in February. I was pretty clueless regarding every aspect involved in such a project and it took me quite a while to figure things out. Thanks to the wisdoms of the internet though, it’s been a raging success so far. At first, there was just a vague idea of what my lamp was supposed to do: a timed dimming sequence to wake me up in the morning. Turns out, this is pretty boring, don’t you think? Why not build something that could do anything you’d possibly want with lights? Automated wake-up light, upbeat disco lighting for your own house parties, illuminating your room when it gets dark or when you return home at night. I’m talking about a fully automated, smart ambient lighting solution. 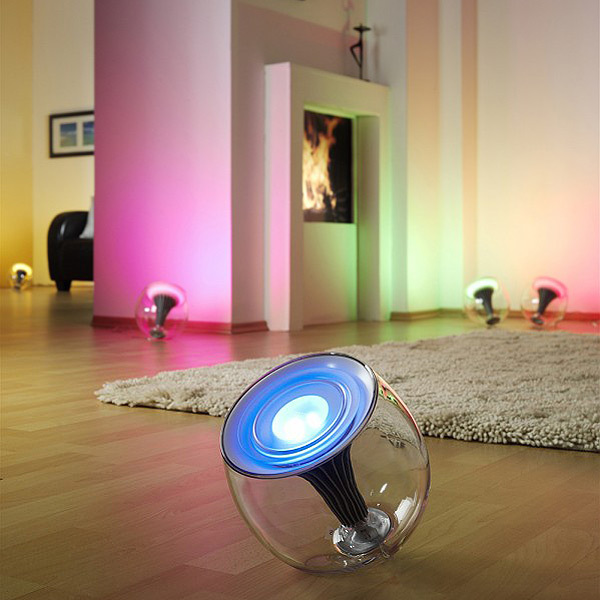 At first, I oriented myself by the “Living Colors” mood lamps by Philips. They seem to be the rage nowadays. It’s a small plastic cone or bulb with an RGB LED you can control via an IR remote. Those lamps do look nice but after all, they still are pretty dumb. You only have a clunky mechanical remote with wonky controls and a rather dull user experience. 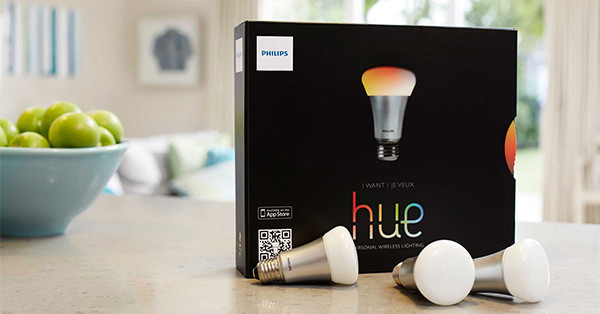 Philips ‘hue’ light bulb is taking the idea much much further. It’s an RGB bulb that can take commands wirelessly from a base station which in turn is controlled by smartphones and tablets. That’s much more like a smart light system. Philips hue is already great in itself – it’s even made hackable via the Raspberry Pi — but it’s really expensive at 60€ for a single bulb. And I don’t think it’s even available in Germany. So I decided to make my very own automated ambient lighting system! Starring the Raspberry Pi as a formidable brain and self-made lamps with RGB Power LEDs and custom drivers. I’ve spent weeks reading up on electronics, schematic design, Raspberry Pi software and hardware, as well as optoelectronics. 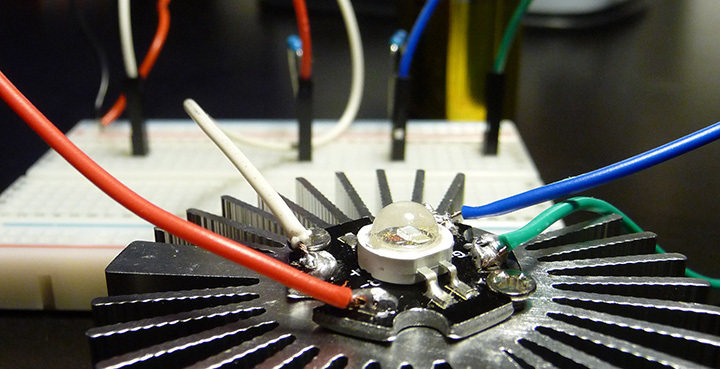 I’ve been steadily adding to my private collection of tools and electronic components, including various transistors, breadboards, cables, LEDs and approximately 700 resistors – lately also LED reflectors and lenses. I’m already running a nice little prototype for quite some time. It’s sitting neatly on my desk, which I’m controlling via a makeshift web app I deployed on my smartphone. The app sends commands over WLAN to a server, which is hosted on the Raspberry Pi . The Pi processes the requests and switches the light on or off, or changes the LED’s colouring. Everything, from hardware to software, is still just proof of concept. The last few days, I’ve been laying out the specifications for a better RESTful service interface to allow for a scalable and extensible system in the long term. I’m planning to add more LEDs, light pattern control, alarms and automation features. One big unsolved question is however, how I could turn the LEDs wireless. Right now, each LED needs to be connected directly to the Raspberry Pi via cables. I’m currently on the lookout for affordable and easy to use Radio Frequency modules, which would communicate the commands wirelessly. But that’ll have to wait for now as I’m still pretty busy with everything else. Here are some photos of the system in action. PS: Yes, those are awful soldering connections. Turns out I’m not such a bad shot at soldering, it’s just that 6€ soldering irons aren’t as good a choice as you’d think at first. You can always start learning! I started at zero with the Pi and Electronics as well. I’m just reading stuff from all over the internet to get going. I admit, there is always some frustration involved at times, but there are also a lot of people willing to help. And it’s lots of fun! If you have any particular question, feel free to ask!